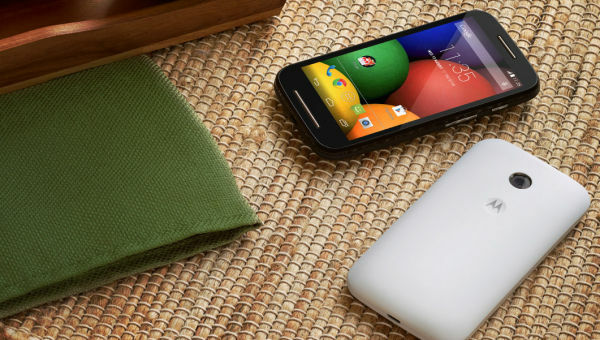 Motorola announced MOTO E in Indian smartphone market. The Moto E is priced for Rs 6999 in india. The phone is now available on Flipkart shopping website. Motorola is preseting Moto E after its grand success of Moto G in Indian market. The stock of Moto G is finished within 15 minutes after the announcement in Flipkart. With a very affordable price tag, yet not compromising on quality and performance, Moto G helped Motorola annex the sub 15k territory earlier ruled by Samsung and Micromax. Motorola now launched the Moto E in an attempt to capture the lower end of the smartphone market in India, launching the device at just INR 6999. The look and feel of Moto E is same as Moto G. It is a lower spec phone of Moto G with same performance and quality. The lack of camera flash, slightly smaller frame and a front speaker grill in the bottom will be the only clues to recognise it. It’s ergonomic and well built body makes it look much more premium than any other mobiles in India with this price range. Moto E is sure to give all the terribly specced smartphones in the segment a run for their money. In order to keep the device affordable Motorola has decided to omit the front facing camera, LED flash, and low internal memory. However, Moto E definitely offers a lot more than it has right to at this price point. Motorola Moto G Vs Moto E Specification Comparison.